In a new tell-all book, former New Jersey Gov. 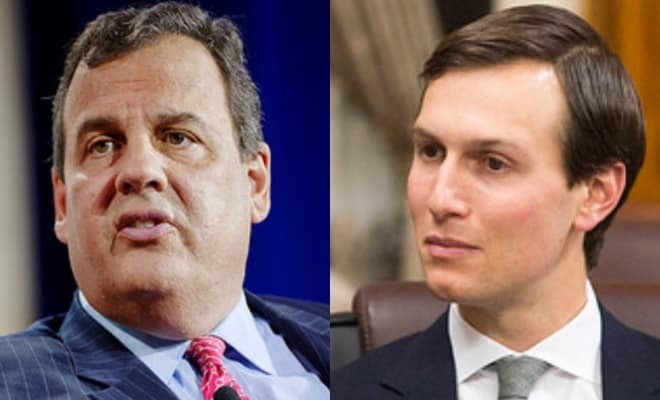 Chris Christie, who served briefly as chairman of President Donald Trump’s transition team after the 2016 presidential election, claims that his ouster was due to one individual specifically targeting him: Trump’s son-in-law adviser, Jared Kushner. Christie’s book, “Let Me Finish,” is set to be released to the public later this month. But according to excerpts obtained by the Guardian US, Christie alleges that Kushner was the main driving force behind him being fired. Christie writes in his book that he was given the information by the man who fired him: former Trump adviser Steve Bannon. The former New Jersey governor, as he was being fired, said he threatened Bannon with going to the media and blaming him for his being terminated unless he came clean and explained who had pushed Trump to force him out. Bannon relented to Christie’s demands and told him it was Kushner. “The kid’s been taking an ax to your head with the boss ever since I got here,” Bannon said, according to Christie. Christie elaborated in his book that Trump’s son-in-law was still sour over Christie’s successful prosecution of his father, Charles Kushner, in 2005 over tax evasion charges. “Steve Bannon…made clear to me that one person and one person only was responsible for the faceless execution that Steve was now attempting to carry out. Jared Kushner, still apparently seething over events that had occurred a decade ago,” Christie wrote in his book. Of course, this isn’t the only reason that Christie has given about his being fired. Over a year ago, the former transition manager said that he was ousted over different circumstances, alleging that his warnings about then soon-to-be appointed national security adviser Michael Flynn went unheeded, and prompted officials to call for his firing from the team. “Suffice to say, I had serious misgivings [about Flynn], which I think have been confirmed by the fact that he pled guilty to a felony in federal court,” Christie said in December 2017.